Season 2 is about to start and there is a big update coming to fix the problems from season one. -There will be 4 seasons each year, lasting 2.5months,after each season your rank resets. -The first season lasts only 1.5 months. -To be able to play competitive you need level 25. -Depended from your skill rating you will be placed in Bronze, Silver, Gold, Platinum, Diamond, Master, GrandMaster Tiers. -Before you can see your rank you need to play 10 competetive matches, you will earn special rewards each season if you finish the games. -You will be able to colect points and trade it for golden weapons. After you get level 25 you will be able to see the competetive play like on the picture above, once you've played the first 10 games you will be assigned a skill rating. The rank will reset after each season and you will need again to play again Overwatch Placement Matches again. At the beginning of each match you will see your skill rating. It can increase or decrease. Various factors come in play, win/lose, skill level of your team etc. 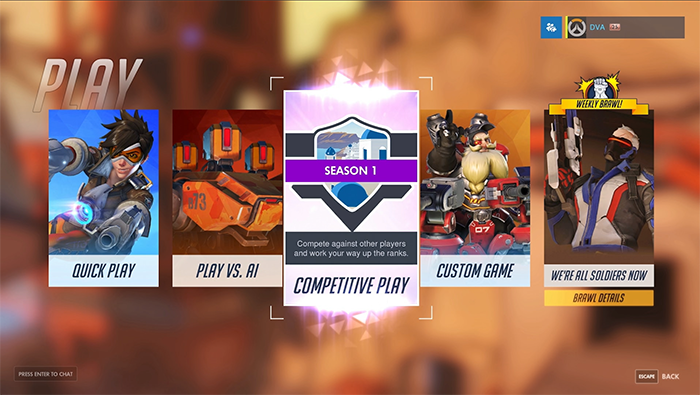 There will be special rewards only available in competitive play, for example each season when you finish your first 10 matches you will get a icon and spray unique to that season. Thats not all, you will be able to earn golden weapons for your favorite heroes, as you win matches you earn Competitive Points. Based on your performance, you’ll also receive a number of points at the end of the season. Those Competitive Points can be exchanged for cosmetic Golden Weapons for your heroes. If you play competitive dont go afk becouse you can get punished for that. If you become inactive or leave within the first two minutes of the game, the entire match will be canceled. Leaving before the end of a match will make you ineligible to join a new game until the original match has been completed.